The John Fitzgerald Kennedy commemorative honoring the president’s birth centenary will be issued Presidents Day, Feb. 20, in Boston, Mass. The forever stamp will be issued in panes of 12. The new Kennedy forever stamp pane also features artwork in the right-hand selvage: a detail from the official White House portrait of the president painted in 1970 by Aaron Shikler. The most recent U.S. postage stamp commemoration of Kennedy was some 30 years ago: a 22¢ stamp issued as part of the 1986 Presidential set issued during the Ameripex stamp show. Kennedy was honored again on his 50th birth anniversary with a 13¢ definitive in the Prominent Americans series issued May 29, 1967. A 5¢ memorial stamp honoring Kennedy was issued May 29, 1964, the first birth anniversary following the president’s assassination in 1963. The fourth American postage stamp to honor John Fitzgerald Kennedy, the 35th president of the United States, will be issued Feb. 20, which is celebrated as Presidents Day in the United States. Kennedy was born in Brookline, Mass., on May 29, 1917, and the new stamp commemorates his 100th birth anniversary. The nondenominated (49¢) forever stamp will be issued during a 10 a.m. first-day ceremony at the John F. Kennedy Presidential Library and Museum in Boston, Mass. The ceremony is free and open to the public. The ceremony will take place prior to the sixth annual Presidents Day Family Festival; there is a fee to enter the library and museum to attend the festival. Because Presidents Day is a U.S. federal holiday (officially designated as George Washington’s Birthday in the United States Code), post offices are closed, meaning the stamp will go on sale nationwide Feb. 21. The John Fitzgerald Kennedy forever stamp was designed by U.S. Postal Service art director Derry Noyes using a 1960 black-and-white photograph by Ted Spiegel showing the 43-year-old presidential candidate campaigning in Seattle, Wash.
Reading up from the lower-left corner, in white dropout lettering, are the year date 2017, “John Fitzgerald Kennedy,” and “1917-1963.” Lettering in the upper-right corner reads “forever” and “usa,” both in lowercase letters. The stamp is being issued in a pane of 12 with decorative selvage at right that shows a detail of the official White House portrait of Kennedy painted in 1970 by Aaron Shikler (1922-2015). The president’s full name and the birth and death years appear again in the pane margin, above the block of 12 stamps. 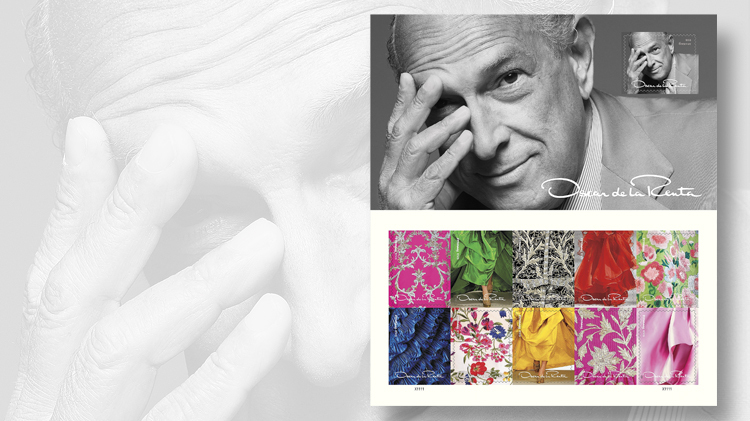 USPS announces another 14 stamps for 2017: The latest announcement includes stamps for a legendary fashion designer and a famous American monument. Along with the pane of 12, the Postal Service is offering an undisclosed number of die-cut press sheets consisting of eight unseparated panes. The press sheets will sell for the face value of the 96 stamps, $47.04. Kennedy was the second of nine children born to philanthropist and socialite Rose Fitzgerald Kennedy and her husband, businessman Joseph Patrick Kennedy Sr.
Kennedy’s younger siblings included Sen. Robert F. Kennedy (1925-68) and Sen. Edward M. Kennedy (1932-2009). John attended the Choate School in Connecticut during his teens and entered Harvard in 1936, where he studied history and government. After graduation, he joined the Navy with World War II underway and was assigned command of patrol torpedo boat PT-109 in the South Pacific. Rammed by a much larger Japanese warship while on patrol in 1943, the PT boat was destroyed and two of Kennedy’s crew were killed. Though injured himself, he saved another crew member, led the survivors to safety, and was awarded the Navy and Marine Corps medal for courage. After the war, Kennedy ran for Congress in Massachusetts as a Democrat and won the seat in 1946. He served three terms and was elected to the U.S. Senate in 1952. The following year, Kennedy married photographer and journalist Jacqueline Lee Bouvier. Their daughter Caroline was born in 1957, and a son, John Jr., was born in 1960. A son born prematurely in 1963, Patrick, died two days after birth. Caroline Kennedy, an attorney and author active in politics, was U.S. ambassador to Japan from 2013 to 2017. John F. Kennedy Jr., an attorney and magazine publisher, was killed in the crash of a small plane he was piloting in 1999. Kennedy was chosen as the Democratic Party’s candidate for the 1960 election, which he won, defeating the sitting Republican vice president, Richard M. Nixon. “In the early months of his administration, Kennedy announced his signature initiative, the Peace Corps, to aid poor people in developing nations,” the Postal Service stated in its announcement of the forever stamp. Kennedy was president for less than three years before he was shot and killed while traveling in Dallas, Texas, on Nov. 22, 1963. The accused assassin, Lee Harvey Oswald, was himself shot and killed two days later by nightclub operator Jack Ruby. During his presidency, Kennedy grappled with the Cold War between the United States and the Soviet Union, confronting the Russians in the 1962 Cuban missile crisis. He proposed important civil rights legislation in 1963, which President Lyndon Johnson would sign into law the following year, after Kennedy’s death. Three earlier U.S. stamps specifically honor President Kennedy. A 5¢ blue-gray memorial stamp was issued May 29, 1964 (Scott 1246), showing a 1958 photograph of the president and the eternal flame. The Scott Specialized Catalogue of United States Stamps and Covers lists the 1964 stamp as being issued with a print run of more than 511 million stamps. By comparison, the new Kennedy forever stamp has an announced print run of 84 million stamps, which is a relatively large quantity in 2017. A 13¢ brown Kennedy definitive stamp was issued May 29, 1967 (Scott 1287), on what would have been the president’s 50th birthday. A 22¢ Kennedy commemorative was issued May 22, 1986, as part of the Ameripex 86 Presidential set (Scott 2219h). Kennedy was also remembered on an 11¢ aerogram issued May 29, 1965 (Scott UC38), and on a 13¢ aerogram of the same design issued May 29, 1967 (UC39). He has also been honored on many postage stamps issued by countries all over the world, including Ireland, the land of his family’s ancestors. Technical details and first-day cancel ordering information for the John Fitzgerald Kennedy forever stamp are provided below. FIRST DAY— Feb. 20, 2017; city— Boston, Mass. DESIGN: photographer— Ted Spiegel, Fishkill, N.Y.; selvage portrait— (official White House portrait) Aaron Shikler, New York, N.Y.; designer, typographer and art director— Derry Noyes, Washington, D.C.; modelers— Sandra Lane and Michelle Finn. PRINTING: process— offset with microprinting; printer and processor— Banknote Corporation of America, Browns Summit, N.C.; press— Alprinta 74; inks— custom light brown, custom dark brown; paper— phosphor tagged paper, block tagging; gum— self-adhesive; issue quantity— 84 million stamps; format— pane of 12, from 96-subject cylinders; size— 1.09 inches by 1.42 inches (image); 1.23 inches by 1.56 inches (overall); 9.35 inches by 6.47 inches (full pane); 19.6 inches by 26.247 inches (press sheet); plate numbers— B followed by two single digits; marginal markings— “John Fitzgerald Kennedy 1917-1963,” plate numbers in two corners (front); “©2016 USPS,” USPS logo, bar code 474600 in upper right and lower left corners, promotional text (reverse); USPS item No.— 474604. Standard ordering instructions apply. Collectors requesting first-day cancels are encouraged to purchase their own stamps and affix them to envelopes. The first-day cover envelopes should be addressed for return (a removable label may be used), and mailed in a larger envelope addressed to FDOI — John Fitzgerald Kennedy Stamp, USPS Stamp Fulfillment Services, 8300 NE Underground Drive, Suite 300, Kansas City, MO 64144-9900. Requests for first-day cancels must be postmarked by April 20. The Postal Service’s uncacheted first-day cover for the John Fitzgerald Kennedy stamp is item 474616 at 93¢. USPS order numbers for stamps and FDCs also appear in Linn’s 2017 U.S. Stamp Program.